Obviously, I write a lot about my kids because quite frankly they are just more interesting than me most of the time. and they are the reason that I decided to start blogging in the first place. First, I was just going to focus on our journey for and with Caden’s service dog, and then I started expanding to cover their rare diseases like primary immune deficiencies, autonomic dysfunction, and will probably be expanding into our newest challenge of training a service dog for Ryley. They are the ones with the stories that need to be told, and let’s face it they are pretty darn cute to include pictures of every once in a while. Granted, my pre-teen has put a gag order on more and more stories these days, which I completely respect and I never tell a story or moment that I won’t be comfortable sharing with my kids when they are older. There are some moments too private, too embarrassing, or too personal for me to ever share on a blog. I have drawn a line, and it is one that I refuse to cross regardless of what point or awareness it might help raise. The story that I have to share today though is my own. I worked my way through school at a painfully slow process and even took a year off to substitute teach to really make sure that higher education was where I wanted to be. From the day that I was given my own class as a teaching assistant, I knew exactly where I wanted to spend my professional life. I loved the challenge of teaching, advising felt like helping students work out their life puzzles, and writing has always been my passion. As my daughter developed her own set of special medical needs, I was more and more convinced that I was in the right profession. I had the ability to work my schedule out to meet her needs. I arranged my schedule to teach while she was at school, I took her to classes with me when she had the day off, and I taught my classes online if I needed to stay home with her. I learned to hold office hours online and continued to love what I was doing. I think what made my work so enjoyable was that my personality in the classroom and out of the classroom were so similar. The language that I used, the stories that I told, the experiences that I was living, and really who my core being was didn’t change in or out of the classroom. I could be 100% me in both worlds. Other than the clothes I wore, nothing changed when I walked on campus or into the grocery store or into my house. My identity was intact and I was happy with whom I thought I was. When Caden was diagnosed with the same immune deficiency that Ryley had I was saddened, not surprised though, and my identity didn’t really suffer any dents. Initially, the autism diagnosis didn’t hurt my identity continuity either. Caden had lost all of his language, and while that was terribly hard he was also young and I didn’t have to worry all that much about my word choices when I talked to him; in fact I talked to him the same way I talked to Ryley. They were just little people at least language wise. Then Caden started (joyfully) getting some language back. At times, language would explode from him. Then he’d regress only to have another word explosion. We started on this roller coaster where one day he could verbally communicate with us and the next he couldn’t. At this same time he developed a receptive language disorder. It was during this time that my identity started to crack a bit. Professionally, I teach organizational communication; I teach people how to be effective communicators in one on one situation, in small group settings, and in front of public audiences. I spend a lot of time teaching and grading my students on things like consistent eye contact, careful word choice, and elaborate language to create strong mental images in their listeners. During lecture, I present multiple examples and often test with short answer questions that have a variety of answers possible if you can justify the choice decided upon. In other words I teach in the exact opposite manner that my own son needs in order to learn and understand or participate in a conversation.For him, we consider it successful eye contact if he at least looks toward your face. We know we can’t present more than two choices if we want him to be able to actually make a decision. 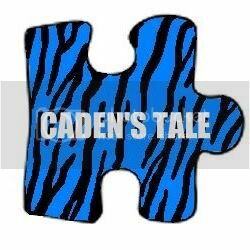 Figurative language and metaphors are a foreign language for Caden. So I have to code switch my language and teaching style on the ride home and become a mommy that Caden can understand. I have to code switch back when talking to Ryley and then again when I am talking with students online or over the phone. Okay, so lots of people have to switch gears on their way home; I’m sure doctors don’t go into graphic details about their day with their children or that salespeople don’t recount every difficult customer they encountered that day. So what’s the problem then? The problem is that I am now doubting myself and who I should be when I walk into the classroom. I find myself struggling to deduct points when someone doesn’t make eye contact because I mentally see Caden standing in front of that classroom. I find myself offering both literal and creative assignments to accommodate the Cadens in the room that can’t handle assignments with shades of gray. I find myself being overly sensitive to students who need to turn things in late or miss an exam because I see them as my Ry struggling with a complex illness that, while life threatening, is also invisible. In some ways, my experiences with my own children are making me a more compassionate and stronger teacher but in other ways I doubt my ability to truly accomplish either world. I don’t know how to have a professional identity and a personal identity that don’t reconcile in any fashion possible. I also don’t know what that means for my future. Maybe it means a new career. Maybe it means a new research line in my field to help me make sense of what I am going through. Or maybe the lesson isn’t in the answer but in the struggle itself. In other words I teach in the exact opposite manner that my own son needs in order to learn and understand or participate in a conversation. For him, we consider it successful eye contact if he at least looks toward your face. We know we can’t present more than two choices if we want him to be able to actually make a decision. Figurative language and metaphors are a foreign language for Caden. So I have to code switch my language and teaching style on the ride home and become a mommy that Caden can understand. I have to code switch back when talking to Ryley and then again when I am talking with students online or over the phone. Caden was up really late last night due to a combination of stressors and routine changes. An hour into his first therapy this morning, his seasoned therapist knew he was not going to make it for the second session and called that off and promised a trip to the park if they could just get 2 more things accomplished on their list. I had absolutely no idea what that meant for the rest of the day, other than the fact it was going to be a l-o-n-g day requiring a lot of caffeine to counteract our lack of sleep. We went out on the porch and watered our various plants and discovered a few strawberries. That led us to a discussion of strawberry shortcake and the decision to make some. We put the necessary flour, baking powder, baking soda, salt, and sugar into different bowls and then felt and tasted each one. Eventually we mixed them together and added the liquids and talked about how the mixture looked now and what we thought it would look like later. Kinda crazy how much we managed to work in about liquids, solids, textures, and measurements while we were mixing and baking. He decided to watch some Spongebob while it baked, which gave me the needed time to fix his lunch. I delivered his lunch to him and let him eat in our bed with the covers pulled up, propped up on a pillow. He was giggly with the novelty and delight of this new lunch-in-bed experience when he wasn’t even sick. Then we watched some more SpongeBob together while we ate our strawberry creation. I had to laugh as he put the whipped cream in one pile, the strawberries in another, and the cake itself in a third pile before he ate each one individually. If I’m honest I did the exact same thing since I detest my foods to be mixed. We snuggled for a while before attempting our own pattern for Mario and Luigi sock puppets. They won’t win any ribbons, but he was able to design and decorate them exactly the way he wanted and learned a few sewing tips along the way. We also covered some basic fine motor skills, although I doubt he would have called the activity anything but fun. After playing tag with the dogs we decided to find some yard sales. When I told him I didn’t know where any were at he suggested I look them up on my phone, and you know he was right. We found some and put them into our GPS and then figured out what we needed to take with us. As we drove around he explained various words to me (like yard sales are called that because they are a sale in a yard and a bedroom is called that because it has a bed in the room…duh). At our first yard sale he found a few SpongeBob treasures and practiced saying hi, bye, I’d like to buy these please, and thank you while counting out his own money and carrying out his own transaction. We drove around some more and found another yard sale that had lots and lots of toy trucks for sale. This one was much busier so I let him take the lead and simply followed him. What I discovered is that he always gets where he wants to go; he just didn’t always take the most direct path in an attempt to avoid crowds or noisy areas. He got where he needed and wanted to go and was generally happy not being forced into overly uncomfortable situations. We came home, played with the new toys, ate dinner and watered the garden. I “accidentally” watered him and then we got ready for bed. There are so many aspects of today that stand out to me. A few of the bigger ones though are that we need to follow Caden more and lead less. He is highly capable, but he is going to do things at Caden’s pace and Caden’s way. His way isn’t better or worse; it’s just different. Social skills, speech, sensory challenges, etc. are easier to work on when you don’t realize you are working on them. No amount of therapy is going to replace the value of the natural setting. I guess by all regards we really didn’t do anything today but yet when I compare it to an actual trip we took a few weeks ago it was cheaper as well as physically and mentally easier. He was for the most part in a setting that he was comfortable in so he just had to focus on having fun. We were interacting at his level with his interests and we accomplished a lot “accidentally” that way. All in all the day was surprisingly a success: maybe doing nothing is really the something that we need to do more often.